The presentations by leading consultants and experts in the field of leader’s brand building and promoting based on online presence, online advertising etc. 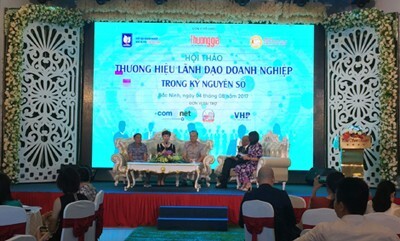 have drawn the attention of over two hundred local SMB participants as well as representatives of businesses from nearby provinces such as Bac Giang, Hung Yen, Hai Duong, Hanoi, Thai Nguyen, etc. A leader is the representative of a business who regularly interacts with a variety of audience including shareholders, partners, employees and customers. They can build good impression and gain public trust towards themselves and also the business they represent. A good leader not only attracts many customers and partners but also helps business reduce negative impacts. When unfortunate event or misinformation emerges, the public who is convinced of the consistent value promoted by the business leader will not immediately react negatively. They will search for more information, listen to both sides and have sensible reactions instead. However, in order to build a successful brand for business leader, the leader himself must practice to possess such “good qualities”. Business leader’s brand also requires similar brand identity as product brand and this identity needs to be demonstrated consistently through style, dress code, language and behavior. Given the 100 per cent operational accuracy and stability of the .com DNS infrastructure for more than 18 years and the over 128.4 million .com domain names registered worldwide, registering a .com domain name is a great option for online brand building for business leader as well as the business itself.